Happy Sabbatical to you all! As most of you know I’ll be away for the first part of a sabbatical stretched over the next two summers. For the next month my family and I will spend some time in Leeuwarden, the Netherlands visiting around the area from where Grandpa Buurstra immigrated 100 years ago. 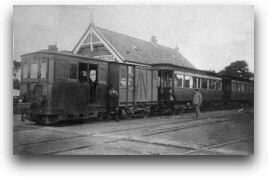 The picture here is from the train station that he may have boarded in Sint Anna Parochie (outside of Leeuwarden) to travel to America in 1907. He left at 18 because the Dutch military required him to join the cavalry and he was deathly afraid of horses. Oh well. When in the Leeuwarden area we will be staying with the Rev. Sita Hofstra whom many of you met when she came and stayed with us in the latter half of May. After being blessed by our hospitality (the “our” is meant to include the hospitality that you extended her), Sita promised to call all of the Buurstras in the Leeuwarden phone book to ask if they think they have long, lost relatives in the States. Oh well??? When we return I’ll spend a few weeks sharing what I’ve learned on sabbatical in sermons. Though we plan on visiting exciting places like Amsterdam, the windmills, Madurodam, the Frisian islands, Ann Frank’s house and concentration camp, etc., I think that my best learnings will be in the area of family roots around the farm country of Leeuwarden. Who knows what God has in store? But it’s not just a Buurstra sabbatical to visit the land of Buurstras, this is your sabbatical, too. How so? In the next month you’ll be able to visit with the North Branch spiritual family through an exciting array of favorite North Branch preachers. Three elders and Pastor Mark will bless us with God’s words so that you can be as refreshed as I will be. On June 29, Elder Paul Soskey will share with us his Ghana trip. On July 6, Elder and Church Planter David Mojica will share with us what God is doing in Ignite’s pre-launch summer worship experience in Somerville. On July 13, Elder Ed Staats will revisit some highlights from the Traveling Light production. On July 20, Pastor Mark will preach whatever God lays upon his heart. And then from July 27-August 10 I will preach on sabbatical learnings. So, happy sabbatical to us all!